Preparing for a substitute is stressful and time-consuming. I've worked hard to simplify and streamline the process of writing emergency sub plans. As I mentioned in my 30-minute sub plans post, these days I can complete my plans much more quickly…that includes all the printing, copying, and prep work. What's included in the Emergency Sub Plans? Do you want to try out these sub plans for free? These print-and-go emergency sub plans are available for each month. They include activities and step-by-step lesson plans for your substitute teacher for reading, writing, math, science and social studies. There are enough activities in each pack for a 1-2 day absence, which makes them ideal for sick days or when you are out for professional development. The lessons are written in a simple, step-by-step format. This makes them approachable for inexperienced substitutes. Even first-time subs report that these lesson plans make the day flow more smoothly. The lesson plan template is provided in a cut and paste format. You can take sections word-for-word and put them into your own sub plan template, saving you tons of time. Printables and answer keys are also included. The plans are currently available for 2nd grade and 3-4th grades. Both sets follow a similar format, but the skills are aligned to meet grade level standards. Keep reading to take a closer peek at what the lessons look like for each subject. The emergency sub plans for reading include a read aloud with companion comprehension activities. Each month's book is carefully selected to align to a holiday or seasonal theme, and a digital read aloud link is included in the directions. This makes it easy for a member of your team to set up in case you are unexpectedly absent or the book is unavailable in your school library. The writing sub plans coordinate with the day's reading. Depending on the month, students will generate either a narrative or expository writing piece that can be revised and turned into a published piece after your return. The complexity of the prompts also varies based on grade. The step-by-step lesson plans guide your substitute through the process of brainstorming, organizing, and drafting the piece. The plans include opportunities for whole group, small group, and partner discussions to get students comfortable with the writing topic before getting started. Graphic organizers and draft papers are included to help facilitate the process. Many subs do not feel confident teaching math lessons. It can also be difficult to “unteach” a poorly taught math lesson. Therefore, the lesson plans included for mathematics focus on review and practice rather than the introduction of new material. Engaging printables are included with each month. These focus around seasonal and holiday themes. The image below shows an example of the math practice from my September Sub Plans for 2nd grade. While many skills are worked into the packs, many of the printables focus on computation and place value. This is because these are foundational skills at these grade levels and are easy for a substitute to support. Story problem practice is also offered and can be included as a must do or enrichment opportunity. Special early finisher tasks are also included. These vary by month and can include games, logic puzzles, and other enrichment opportunities. The plans for science and social studies use original nonfiction passages related to seasonal topics. This can be holidays, special events, or commonly taught units during specific times of the year (like government and elections in November). The lesson plan guides your guest teacher through the natural process of introducing the topic, activating prior knowledge, reading to learn, and demonstrating understanding. In addition, opportunities for discussion and partner work are included. The passages are accompanied by multiple choice and a free response question. These align to CCSS informational reading standards and the TEKS. They use question stems commonly seen in standardized testing to give your students some additional practice with this format. Two passages are provided to give you an opportunity to select which is best for your students or to use across two days. These lesson plans include a simple STEM challenge that use items readily available in most classrooms or campuses. The students create their Engineering Journal to record their process and learning. Using the simple step-by-step lesson script, your sub will introduce the STEM challenge question and have students explore the materials they'll use. Then students will work in small groups or partners to complete the challenge, recording their work in their journal. The Engineer's journal includes opportunities to brainstorm, sketch models, and synthesize learning. Students easily create these books in just minutes, and the directions are included as a part of the lesson plan. Click the button below to get a set of free sub plans for 2nd, 3rd, or 4th grade. Your free sub plans include a full day of space-themed lesson plans and activities that can be used any time of year. 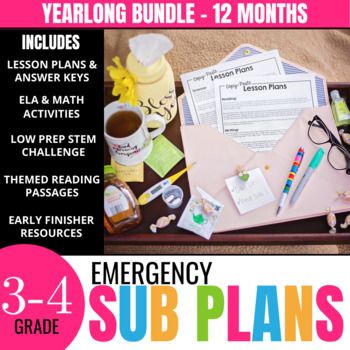 These sub plan sets are currently available for grades 2-4. To accomodate year-round schools and summer school programs, monthly sub plans sets were created for all 12 months of the year. 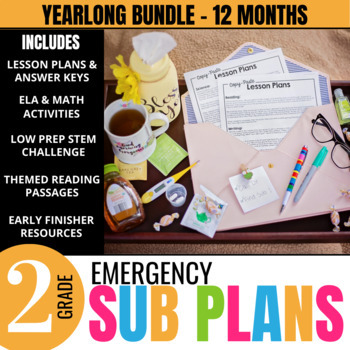 You can purchase these Emergency Sub Plans individually or at a discount in a yearlong bundle on Teachers Pay Teachers. 5 Simple Tips for a Better Sub Experience – It's more than just sub plans!